Known For: Consistant play. Winning big and losing big. 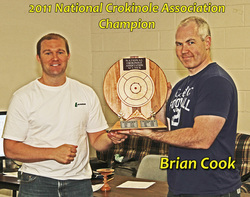 Brian claims he does not remember when he started to play crokinole, it was just one of the games that was always there. This may lay truth to the rumor that he was born with a crokinole disc in his hand. He does know that his father taught him to play crokinole on one of the boards that he built. Being a big fan of all games, Brian’s father still makes crokinole boards today. Perhaps the most decorated player to ever grace the board, Brian holds Joe Fulop in high regard. To quote Brian, “The legendary Joe Fulop. As good a player as there’s ever been – unshakable on the 20s, unflappable nerves, killer instinct yet always gracious in supporting younger players, even the ones that were growing threats to him in tournaments. And if not for his health problems, he’d still be dominating the crokinole world today.” Brian has faced and beat the best players in the world and knows that if his focus is on his own game, and he makes his shots, it does not matter who the opponent is. When nothing is on the line, Brian enjoys a great doubles game, but in tournaments, he prefers singles so he can stick to his own particular style of play. The long list of major achievements below shows how dominant Brian has been on the Crokinole circuit over the last several years.